President Donald Trump and European Commission President Jean-Claude Juncker deliver a joint statement on trade in the Rose Garden of the White House Wednesday in Washington, D.C.
Trump and Juncker appeared after a White House meeting, with both sides saying progress was made toward resolving some of the trade issues that have soured the relationship between the U.S. and the EU since Trump imposed tariffs on EU exports of steel and aluminum. Trump said the two agreed "to work toward zero tariffs, zero non-tariff barriers and zero subsidies on non-auto industrial goods." Trump also said "We're starting the negotiation right now, but we both know every much where it's going." While the EU agreements to buy more U.S. soybeans and energy were tangible, the bigger result of the meeting may have been the retreat from the threat of a full-scale trade war between the two sides. Trump said they'll work to resolve the steel and aluminum tariff issues, calling it "a new phase in the relationship" between the U.S. and the EU, and "a very big day for free and fair trade." Juncker said it was a "good, constructive meeting." 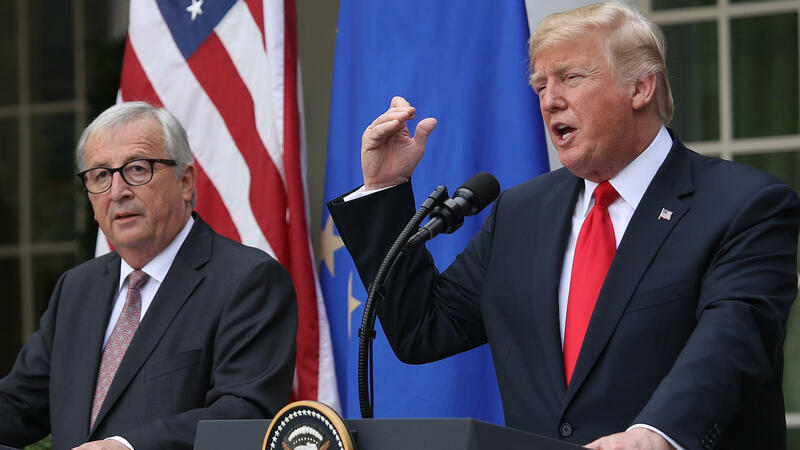 Earlier in an Oval Office photo op, Juncker said the U.S. and EU were "allies, not enemies," a rebuff of Trump's recent comments, in which he labeled the EU a "foe." The president had threatened to impose tariffs as high as 25 percent on European autos imported in the U.S. which brought a EU promise of retaliation.